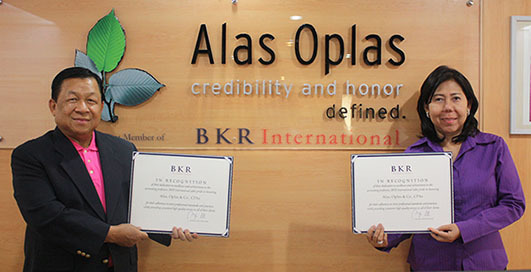 Mr. Donnies T. Alas, Chairman/CEO and Ms. Marycris S. Oplas, Managing Partner of Alas Oplas & Co., CPAs receive a certificate of membership from BKR International effective May 1, 2014. Testimony of Alas Oplas & Co., CPAs' dedication to excellence and achievement in accounting profession, with adherence to strict professional standards and practices, while providing consistent high quality service to all our clients. MAKATI CITY - Alas Oplas & Co., CPAs serving clientele for over 20 years, announces its affiliation with BKR International, a leading global association of independent accounting and business advisory firms. Ranked #6 by the International Accounting Bulletin's 2013 World Survey, BKR International members have access to the resources of an international firm, while delivering the personal attention and service that all clients deserve. "As an established firm dedicated to our local business community, we are better able to service our clients' needs, locally, nationally, and internationally, because of our affiliation with BKR International," says Managing Partner Ms. Marycris S. Oplas. "BKR's global infrastructure, along with the expertise of more than 930 partners and 7,000 professional staff, provide a tremendous resource for both our firm and our clients. As an independent member of BKR International, we can now help clients take advantage of global opportunities and achieve their unique objectives in virtually any industry anywhere in the world." BKR International is a leading global association of independent accounting and business advisory firms representing the expertise of more than 150 member firms with over 350 offices in over 75 countries around the world. Please visit www.bkr.com.